Squirrel Removal | Squirrels in Attic | Westchester, NY. Squirrel Removal can help you with all of your squirrel control issues in the Westchester, Rockland, Putnam, Bronx and Greenwich, CT. Squirrel removal services also helps with the damage that also comes from chewing electrical wires. Since the squirrel is a rodent, their front teeth always grow causing the squirrel to constantly chew to keep their teeth sharp and at a manageable level. Call the experts at squirrel removal when you need to repair damage caused by squirrels or to prevent squirrel entry and damage in the first place. Don’t let the squirrels take over your home. Give QualityPro a call today and rid your home of squirrels and all nuisance and problem animals. Squirrel Removal Experts offer a complete and full-service pest control company that will assist you with problems caused by squirrels, bats, raccoons, snakes, birds, skunks, Opossums and more. We love a challenge so give QualityPro a call! Our experience includes jobs such as wildlife management, raccoon control, skunk removal, snake removal, wildlife control, trapping, squirrel removal. 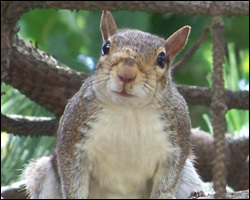 Our expert Squirrel Removal technicians remove Squirrels and their nests and try to prevent stress or injury to them. This is also a practical and economical approach. Removing breeding Squirrels may leave the babies to die in your building, attracting unwanted bugs and parasites, causing further health risks. Squirrel removal of carcasses is a time consuming, costly and sometimes necessary process. Click here for facts about squirrels.